The latest mid-range offering from HTC, the U11 Life recently received OS platform step-up to Android O. 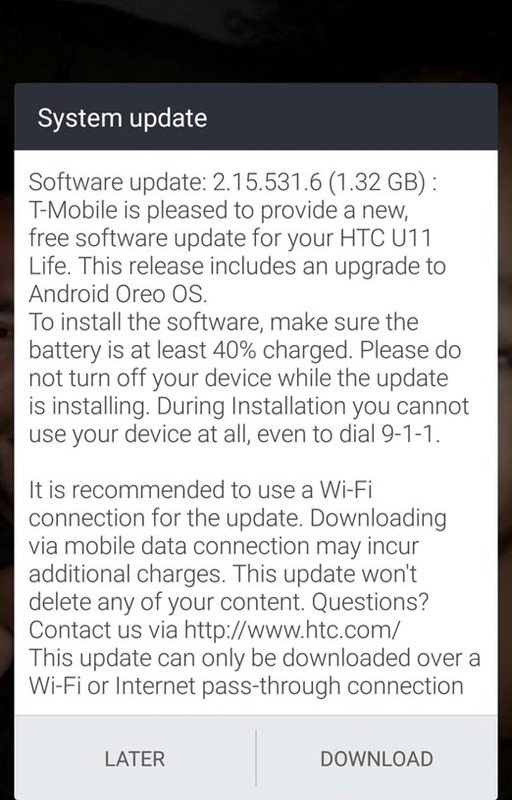 Now, US tele-carrier T-mobile is also rolling out the Oreo for HTC U11 Life.It moves the firmware build number of the device to 2.15.531.6. The package is moving over-the-air(OTA) and it weighs a massive 1.32 GB in size. It might take a while to drop into all devices. This phone comes with 7.1 Nougat out of the box with HTC’s own Edge sense UI. Now the Oreo will add taste to the efficiency of the smartphone. The above update, as usual, is concentrating exclusively on Android O. So, all the features like picture-in-picture, autofill API, a new set of emojis etc now comes to the device. Also, there is no mention of security patch level, but which we guess is set to that of December. Apart from the OTA, the stock firmware is also available which users can download from the link given below. We have also explained in detail on how to install it and upgrade to Oreo. How to install T-Mobile HTC U11 Life stock RUU EXE Oreo firmware update? The download section is listed below. There are two ways by which you can flash the latest software on the T-mobile HTC U11 Life. Use this process if you have the full stock RUU.exe file from the manufacturer. It can move the device to Android 8.0 from any firmware version. Here are the steps below. Step-1 First, download the HTC U11 Life RUU.exe file. Step-2 Move the downloaded file to a PC. Step-3Connect HTC device to your PC via USB cable. Step-4 Run the HTC U11 RUU.exe file. Then, you will see the update wizard. Step-5 Follow the system update wizard instructions. Step-6 Click Finish after the installation is over. The device will now reboot. Now let’s take a look at the 2nd method to perform the installation. The second method is flashing the RUU OTA zip and update to the new OS. Here are the steps. Download the RUU zip file. Move the file to external or device storage. Rename the RUU zip file for your convenience and save it to the root of your external SD card. Reboot the device into Download mode by turning it off. Then press and hold volume down (or volume up) and power buttons at a time. Select the correct option to enter download mode. After entering the download mode, the device will start scanning the SDcard and detect the zip file. You will see a prompt “Do you want to start update?”. Use your volume Up/Down key to start or cancel the flashing process. Wait while the installation process finishes. So, that’s all you have to do. Now, enjoy the bite of Oreo with your HTC U11 Life. Here is the direct download link for the ROM zip of the OS update. The RUU EXE firmware file will be uploaded here for the T-Mobile HTC U11 Life. Follow and Subscribe to AndroidSage for all latest firmware updates and downloads regarding Android 8.0.